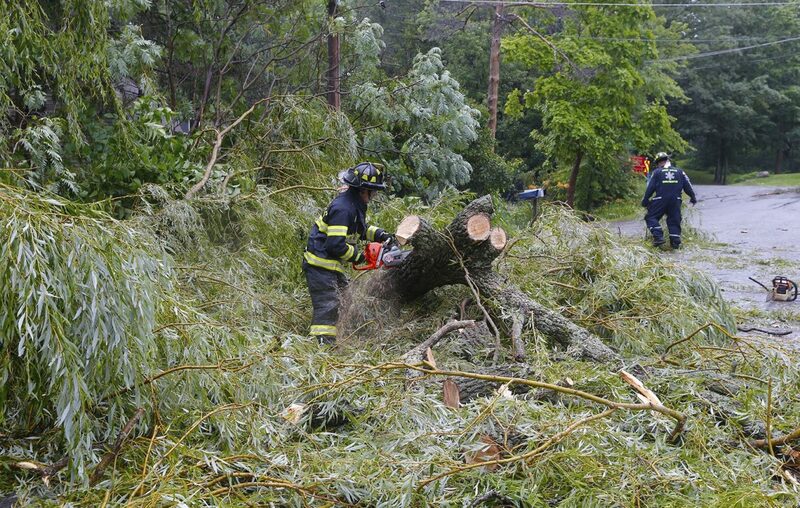 The powerful storms that spawned two tornadoes in the Southtowns Thursday, ripping through Hamburg, Orchard Park and Holland, also produced a third tornado: this one near Angelica in Allegany County. "The same storm put down multiple tornadoes," said National Weather Service meteorologist Aaron Reynolds Friday. The first tornado, an EF2, struck at 12:30 p.m. Thursday, cutting a 5-mile long, 700-foot wide path from Hamburg to Orchard Park with top winds at 105 mph, the weather service said. The second hit the Town of Holland at about 12:50 p.m. This one was an EF1 with winds topping out at 95 mph. It traveled for 2.5 miles and was about 500 feet wide. The Angelica tornado was reported at 1:40 p.m. and was an EF1, with 95 mph winds. It traveled 4.2 miles and was about 300 yards wide. No injuries or fatalities have been reported in association with any of the tornadoes. "Based on radar and spotter reports two thunderstorms merged and intensified and produced a tornado that extended from the Town of Allen across the Town of Angelica to the Town of West Almond," the National Weather Service reported. "Several homes were damaged. A barn was severely damaged. Several sheds or small outbuildings were tipped and moved. Numerous large trees were shredded and downed. Some fell causing additional structural damage."